Well, we tried to get this issue out by the end of the year, but just didn’t quite make it. I think most of you will find that this issue was worth the wait. Of special importance in this issue is information on the Force Development Update (FDU) recently submitted by the AG School, found on page 20. We are indebted to LTC Steve Shea, Mr. David Galasse, and the rest of the AG School’s Organization Division for their support in the preparation of this article. 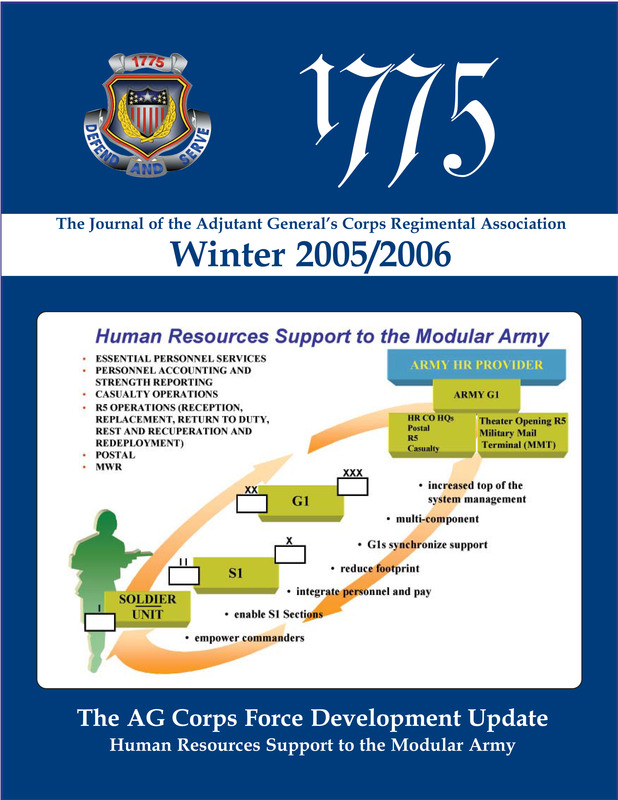 In the next issue we plan on featuring the work that is being begun by the AG Corps’ New Organization Training Teams (NOTT) as they provide training and guidance to AG Corps Soldiers, to enabling them to transisition their units to the new force structure. These teams are scheduled to begin their training missions in 2006. We need you, the AGCRA membership to provide us articles. Tell us what your chapters are doing, tell us what your unit is doing, and tell us how to perform the business of the AG Corps better. We look forward to hearing from you.